When it comes time to leave for vacation, you may not have your thoughts focused on your residence. Images of beaches, indulgent menus, or slowly sipping a beverage may be floating through your head as you sort out your schedule, airport transportation, and make packing lists. It is important not to neglect your property when you take off, though, especially during the winter. Winterize: Getting your home prepared for the winter is crucial to maintain your property, even if you are going to remain in town. Clean the gutters, get a furnace inspection, and have your roof checked to ensure your home is ready for the freezing temperatures and harsh conditions. You should also ensure that pipes are properly insulated. Take special care with those that are located near external-facing walls or in chilly areas like the attic, garage, or basement. Have Someone Check In: Ask a friend or hire someone to act as a presence on your property. They will be able to clear snow, collect newspapers, and water the plants. Check with your insurance broker about home monitoring and how it may impact your policy. 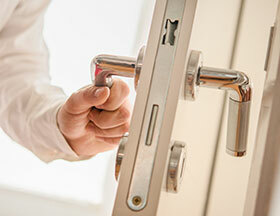 Some providers require that a person be present at the property every 24 to 48 hours. Use Security Alarms: If you don’t already have a monitoring alarm system, consider getting one installed before you leave. It can help reduce your insurance premium and also allows you to check in and rest easy knowing that your place is as you left it, whether you are down the street or on the other side of the world. Keep it Quiet: Announcing your vacation plans can be exciting but it can also open you up to unnecessary risk. Try not to broadcast your travel plans in person and online to avoid making your property an easy target for ill-intentioned thieves. Check Things Out: Time your lights, unplug electronics, and check large appliances before heading out the door. Take the time to ensure everything is in good condition and does not pose a fire hazard, flood risk, or tip off a passersby that you are out of town. Have a plan and make time to prepare your home thoroughly. Settle Services: For extended trips, arranging to postpone, redirect, or cease mail service, cable, and internet can not only help you save, but lead to less maintenance and concern while you are away. Enjoy peace of mind as you head out on your next adventure with affordable and extensive home insurance in Durham. The insurance brokers at Petley-Hare can help you find the perfect policy that takes your travel habits into account while still providing thorough and affordable coverage. Request a Free Estimate online for your home insurance or set up a consultation with a member of our team. Call Petley-Hare today toll-free at 1-800-216-5324 for home insurance in Bowmanville, Oshawa, and Durham. Get your Free, No Obligation Quote Online.